You are here: Home » GENRE » Horror » Blood On Satan’s Claw adapted by Mark Morris (audio book review). 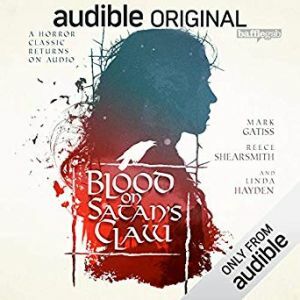 ‘Blood On Satan’s Claw’ is a full cast Audible Original audiobook based on a cult 1970s horror movie of the same name. Its voice cast features the well-known names of Mark Gatiss and Reece Shearsmith (apparently both big fans of the film), alongside one of the original film’s cast (Linda Hayden) and the screenplay has been written by Mark Morris. One day, villagers in the small village of Hexbridge discover a long-buried skull in one of the local farmers’ fields. Soon after, the young people of the village begin behaving in odd ways, becoming secretive, disrespectful and often aggressive. As people begin disappearing and the death toll rises, rumours of possession and visitations by the devil begin to take hold among the villagers. The local squire and vicar form an unlikely alliance to investigate, uncovering horrors beyond their imagining. When faced with the ultimate evil, can two men prevail and prevent the devil from being reborn on Earth? While horror isn’t usually my genre of choice, I was intrigued by the idea of an audio version of a horror film. The fact that it included Mark Gatiss was a real selling point and I expected him and Reece Shearsmith to be really good at delivering an intense story without the aid of any visual media. However, ultimately I’m not sure they were really suited to this story, giving less of an intense horror experience and more of a hammy over the top caricature of a horror story. It felt as though the writer had aimed for serious but nobody had told the cast to take it seriously, so that what could have been quite scary just resulted in me rolling my eyes a lot. I also found the overuse of screaming and heavy breathing to be annoying rather than atmospheric and again it just took things to a point where they were totally unbelievable and disrupted the immersion into the story. When I listened to this, I’d just finished an excellent audiobook version of Iain M. Banks’ ‘Excession’, narrated by the very capable Toby Longworth. Going from that, where one person successfully created a whole host of individual characters, to this full cast recording, I was surprised to find that it was more difficult to distinguish between characters in ‘Blood On Satan’s Claw’. There was very little depth to the characters and it wasn’t easy keeping up with who was speaking and how they related to the other characters. I know that in the short length of this story at 144 minutes, it was always going to be difficult to create fully realised characters but even so, there could have been half as many characters and I’d still have struggled. It took me a couple of attempts to make it all the way through this audiobook because I found my attention kept wandering. Ultimately, making it to the end, I found that even then it was disappointing as the climax and its resolution happened very quickly and too conveniently. I don’t know if there was a time limit imposed upon this production, but it could have done with taking another hour and adding a bit more depth to both storyline and characters. I’ve not seen the original film, but after listening to this, I doubt I’ll be seeking it out any time soon. Titan finds the horror with author Mark Morris. « Sinless (Eye Of The Beholder: Book 1) by Sarah Tarkoff (book review).